Lieutenant Eve Dallas fights to save the innocent—and serve justice to the guilty—on the streets of New York in Connections in Death, the gritty and gripping new In Death novel from #1 New York Times bestselling author J.D. Robb. 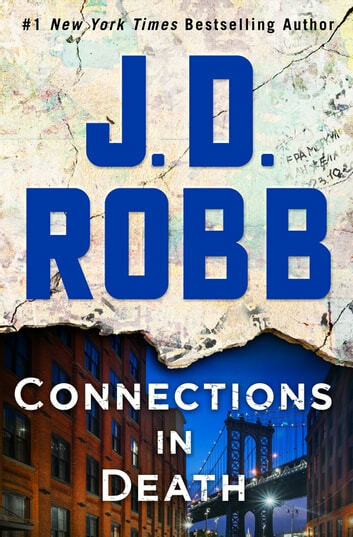 Homicide cop Eve Dallas and her billionaire husband, Roarke, are building a brand-new school and youth shelter. They know that the hard life can lead kids toward dangerous crossroads—and with this new project, they hope to nudge a few more of them onto the right path. For expert help, they hire child psychologist Dr. Rochelle Pickering—whose own brother pulled himself out of a spiral of addiction and crime with Rochelle’s support. Lyle is living with Rochelle while he gets his life together, and he’s thrilled to hear about his sister’s new job offer. But within hours, triumph is followed by tragedy. Returning from a celebratory dinner with her boyfriend, she finds Lyle dead with a syringe in his lap, and Eve’s investigation confirms that this wasn’t just another OD. After all his work to get clean, Lyle’s been pumped full of poison—and a neighbor with a peephole reports seeing a scruffy, pink-haired girl fleeing the scene. She's back in the groove. This novel is much better than her last. I have read every book in this series and none of them disappoint. I love all the characters,which is important to me. As a sci/fi fan, that part of this series appeals to me. Can't wait for the next one. Eve Dallas at her best! Couldn't put it down. Highly recommended to In Death fans. Another awesome read. Eve and Roark, along with Eves Division bring down two gangs and find justice for a former gang member who had turned his life around and had a very bright future. Each new book has more interaction between all the characters. As soon as the book was relased I had to get it and it drew me into the story so i had to keep reading until I finished it. This series continues to keep us intrigued in the lives of Eve and Roark and how they work together and more insight into their off time lives. I would recommend this book and the entire series to everyone, can't wait for the next. I really enjoyed this book. Lots of action, lots of interaction within the main characters. I've enjoyed all of the books in the "In Death" series as well as Nora Roberts books too. I would highly recommend this book and in fact the whole series to anyone who enjoys a book with lots of emotional connections as well as a good murder mystery.